Even the most diligent of parents cannot escape a diaper rash or two on their baby. When your baby does get a diaper rash, you want to make sure that what you are slathering on contains only natural and safe ingredients. Many commercial diaper creams have toxic ingredients such as BHA, fragrance, methylparaben, and boric acid; just these four ingredients are linked to everything from allergies to cellular changes to cancer! Even some of the more natural diaper creams may contain not so great ingredients. On top of the ingredients, there is also the cloth diaper issue to think about. 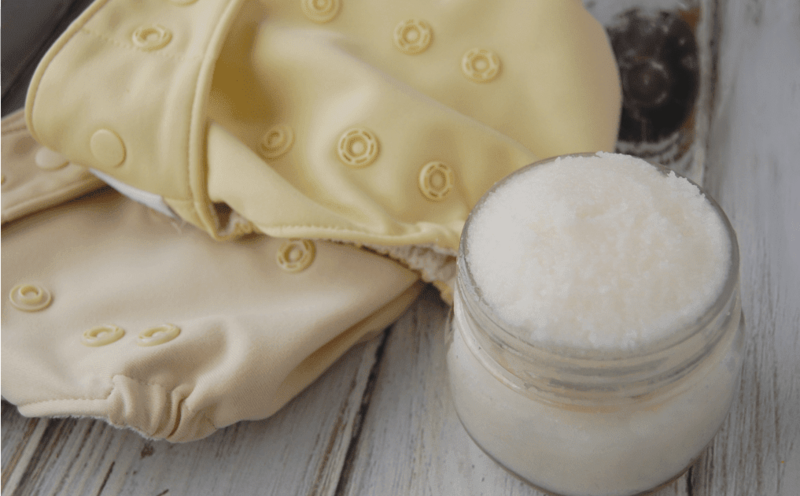 If you use certain diaper creams on cloth diapers they will become ruined as the cream will coat the insert and then cause the diaper to repel instead of absorb liquid. 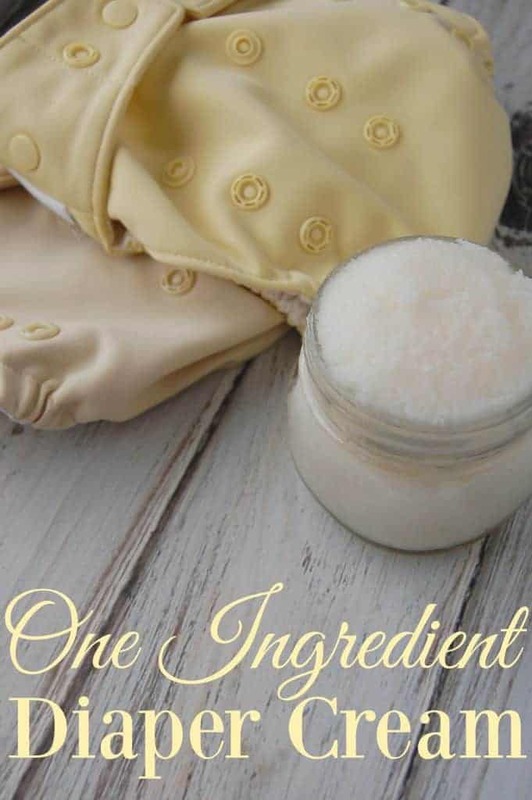 However, what if I told you there was a recipe that contained just 1 ingredient that easily replace diaper creams and is safe for baby and cloth diapers? What is that one amazing ingredients? Coconut oil! Ah yes, coconut oil. What can’t that stuff do?! Since coconut is antifungal, antiviral, and antibacterial this is a wonderful choice for diaper creams. In addition to it’s healing properties it is also a great moisturizer. Now you can just keep a jar of coconut oil on the changing table, as that is what I have done for over a year now. However, coconut oil can get pretty hard during the cooler months making it a bit more annoying to use. Which brings us to whipped coconut oil. I’d hardly call this a recipe as there really is only one ingredient however, taking a few minutes to whip up coconut oil is well worth it. The texture is amazing and you can scoop it out much easier. Coconut oil – amount simply depends on how much you want to make. Mix/blend away until you get a nice whipped consistency. That’s it! After you have your whipped coconut oil, place in a container and you are ready to go. Variations: There are other ingredients that you can add to your diaper cream if you would like. Some of the more popular optional ingredients are: Vitamin E, chamomile essential oil, or calendula. You can also check out my recipe for lavender diaper cream. We always used coconut oil, too. I never thought to whip it, though, for an easier consistency! In the summer, the house is pretty warm (well, hot), so it's always liquid then. I'll definitely keep this in mind for the next baby, since we're out of diapers right now. I just found your blog through pinterest and I love what I've read so far! When I got to the coconut oil post, I just had to comment. I discovered this just a few months ago and LOVE it! At first I thought I was just imagining, but the more I use it the more convinced I am that it really is amazing stuff. I just posted a blog tonight about my family's use of coconut oil on a blog my sister and I just started (goincrunchy.blogspot.com). Anyways, I am excited to have found your blog! Oh yeah, and I ordered a sampler from Yoreganics! Thanks for the tip. I can't wait to try the soap nuts. Will it keep the whipped consistency in the fridge? I would say that it will keep better consistency if whipped in the fridge (compared to just coconut oil) but it will definitely firm up so I don't think it will be as easy to scoop. Hi, Do you know if this is safe for use in cloth diapers? Also, does it matter if the coconut oil is refined or unrefined? Thanks! Yes it is cloth diaper safe! It doesn't matter if the coconut oil is expeller pressed (manually refined..so it doesn't smell like coconut) or cold pressed (still smells like coconut and is the best nutrient wise). You just want to avoid chemically refined coconut oil but that is only for avoiding chemicals…it technically wouldn't effect cloth diapers. Those diapers are really cute!